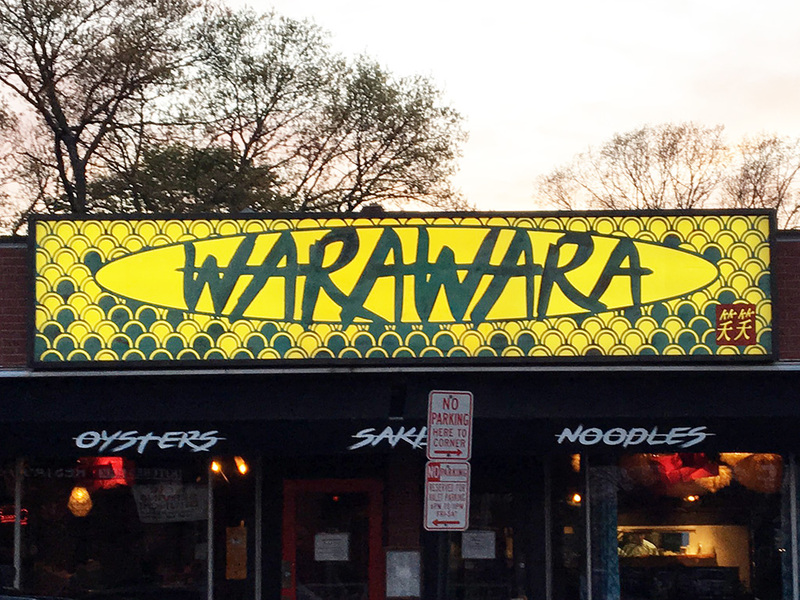 Wara Wara opened around February 2016 in Providence and there was a lot of buzz about this new Japanese restaurant specializing in ramen and tapas. 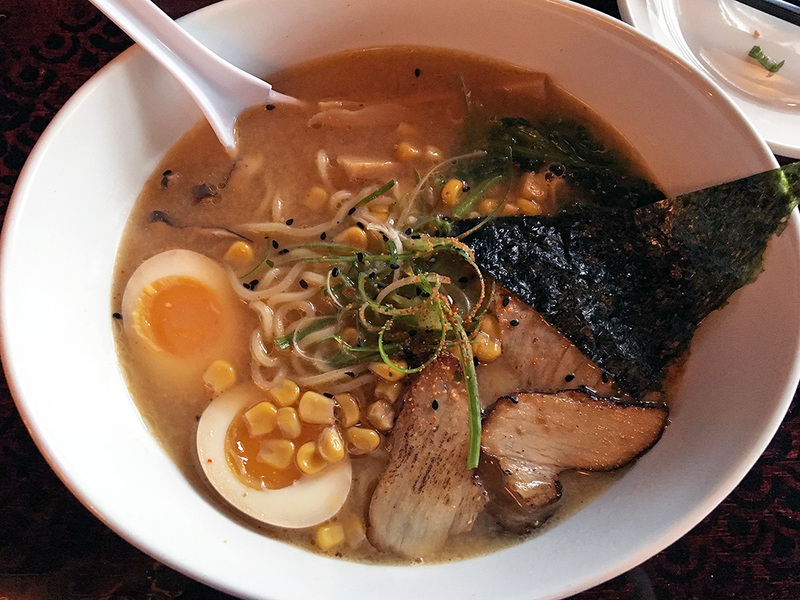 With so few options in Providence to enjoy good ramen, I knew I needed to get over there and see what Wara Wara had to offer. Usually, I run for the hills when I see a tapas restaurant because my personal feeling is that, “tapas,” is code for: “small portions of mediocre food at high prices.” Luckily, the prices at Wara Wara were reasonable and the food tasty. I expected typical Japanese food, but received a much more eclectic spin on classic dishes. It’s hard to miss Wara Wara’s bright yellow sign out front, which is a nice change from the trendy concept of making places hard to find. The interior is equals parts light and dark due to the big windows that shed light on the dark wood tones of the restaurant. 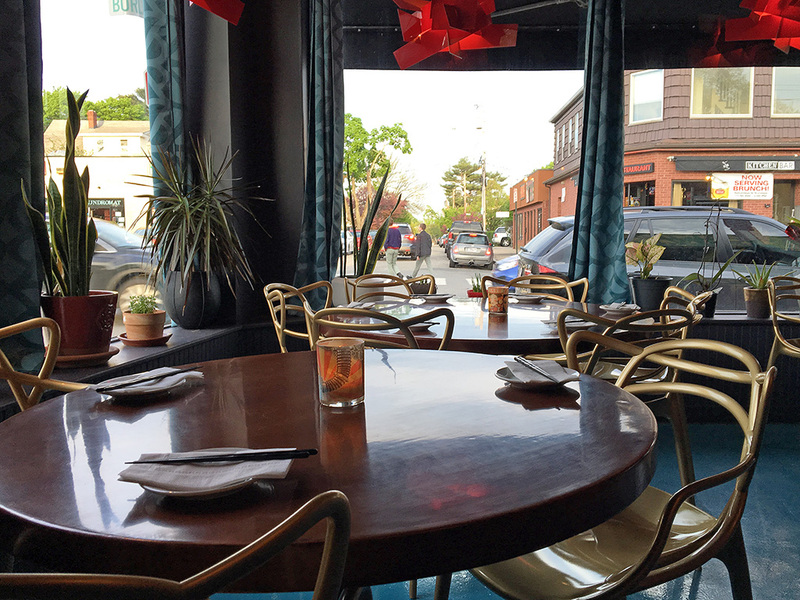 The spacious environment offers bar style seating, high top tables, and traditional table seating, which is a nice contrast to some of the smaller, often crowded, ramen establishments. The service is very friendly and willing to answer any questions about the menu. Wara Wara takes a playful approach to Japanese flavors by combining them with influences from other cultures. Squid, for example, is found frequently in Japanese culture, but the fried calamari preparation is a little bit more Chinese, Italian, and Italian-American. Using corn in their ramen is another example of some cultural cross-over. They even use kimchi, which is Korean, in their pork belly buns. The results are tasty and unique preparations of fairly traditional Japanese fare. 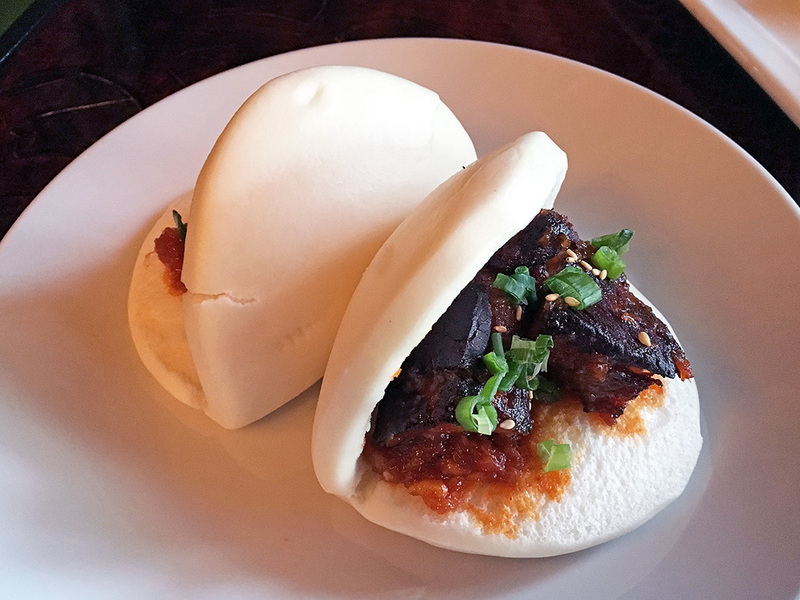 Pork Buns – The pork belly buns at Wara Wara are different than any I’ve tried before. Usually, the pork belly is almost fall apart tender due to a sweet braise. These pork belly buns reminded me more of a latin-inspired preparation because while the sweetly tangy flavors of the kimchi honey miso sauce were all Japanese and Korean, the pork belly itself was crispy. Even though the approach is different than what I am used to, I could see this style appealing a little more to those that might shy away from a more tender preparation due to the fattiness of the meat. The crispiness evoked bacon without the smoke and contrasted nicely to the soft steamed rice bun. 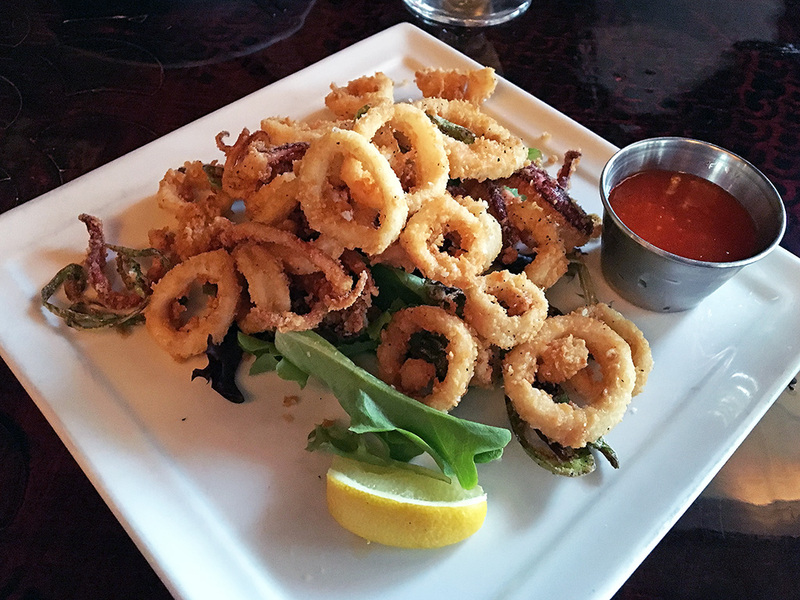 Calamari – This dish was simultaneously Asian and Italian-American. I will say that this is one of those rare dishes that I found extremely salty, but somehow that saltiness didn’t deter me from enjoying the dish at all. The salty and peppery calamari breading reminded me of the kind of fried squid sometimes found at Chinese-American fast food restaurants, but in a much more savvy form. The mango sauce that accompanied the calamari portrayed a wonderful contrast of sweet, savory, and tangy that delivered a tropical yet Asian feel to the dish instead of the usual marinara sauce. Last, but not least, the thinly sliced, fried pepper garnish was a fantastic and delicious addition to the dish. Rhode Island style calamari uses spicy pickled yellow banana pepper rings as a garnish, but I far preferred this take on peppers with calamari! Miso Ramen – First, let me say that as a whole, I definitely enjoyed Wara Wara’s miso ramen. It’s a nice blend of traditional Japanese flavors with some less traditional ingredients like corn. It may not be the best ramen I’ve ever had, but it hits the spot. The broth, which is arguably the most important element of ramen next to the noodles, is light yet flavorful. It was a little on the salty side, but still well within what one might expect from miso ramen. The noodles were thin, but not too thin, and a little chewy, which I like. The soft boiled egg was perfectly cooked and a richness to the soup. I thought the corn was interesting and very filling, but I’m still on the fence about the sweetness it added to the dish. One ingredient I could have done without is the bamboo shoots. I usually don’t mind them in other dishes, but in this case they gave the soup a somewhat off-putting aroma. That’s a personal preference though and I know that some people love the added funk from bamboo shoots in their soup. As far as the pork in the ramen goes, the pieces were a little smaller and more well done than I am used to in ramen. It tasted very good, but the texture was firm instead of the usual melt-in-your-mouth style of pork in a more traditional ramen. Overall, this is a really nice, solid take on ramen that I would recommend in the Providence area (minus the bamboo shoots for those unfamiliar with that flavor in soups). Wara Wara is a great option for ramen in a city that desperately needs more good ramen. The restaurant looks great and the food is pushing the limits of typical Japanese cooking with some added multicultural elements. Go for the Japanese food, but expect something a little different in the overall experience. While it may not be the best ramen you’ll ever have it will definitely satisfy those cravings and deliver on an overall enjoyable dining experience. I know I’ll return again and again just to try out the many creative items on Wara Wara’s large menu. Please Support Home Is A Kitchen! No spam. Just real updates on recipes, restaurant reviews, travel, and free giveaways! Copyright © 2016 Home Is A Kitchen. All Rights Reserved. The content on this page is owned and written by Home Is A Kitchen (www.homeisakitchen.com). Duplication or use of this content without permission is prohibited. The presence of this content on any other site or medium is a violation of this Copyright. For permission requests to use some or all of this content, use the contact form in the “About” section. Ramen + tapas are an odd combo but two things my husband and I love. We’ll have to give it a try. Nice find! Definitely try it! As I mentioned, I’m super skeptical about tapas places, but Wara Wara is very loosely a tapas place in my opinion. They have some small plates, but they’re mostly like an appetizer anywhere else. Thanks for recommending this place with positive input. Like you, the word tapas can repulse me. I will definitely give it a try now. Awesome blog and great pics ! Thanks for sharing. Thanks so much Mindy! The kind words are much appreciated! Corn is actually quite traditional, but great reviews!